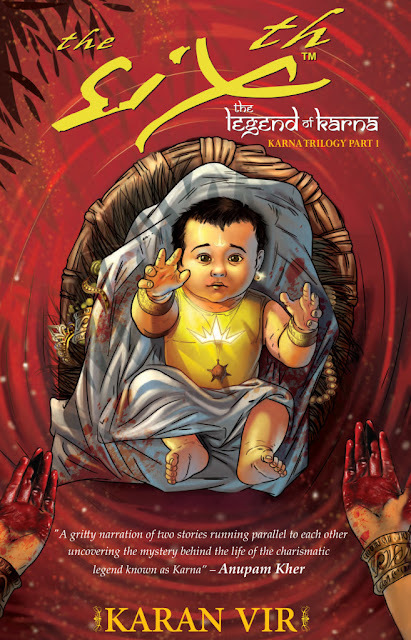 When I got the opportunity to choose a book from a list of titles by leadstartcorp to review, I was instantly interested in this title The Sixth - The Legend of Karna by Karan Vir. Readers who have followed by blog will know that I have a special liking for books based on Indian mythology. This book is not entirely mythological, but a blend of two stories from two eras, running parallel and culminating into something interesting for the readers. This is the debut book of the author and is supposedly Book 1 of his Karna Trilogy. Karan vir Oberoi is the main protagonist of the novel. He is a real estate tycoon living in New York. But, something has not been right in his life of late. He is experiencing recurring dreams of an ancient warrior clad in golden armor and golden earrings. There is a sense of déjà vu, and he feels as if the warrior wants to tell him something. Even though he tries hard to make some sense of his dreams - he ends up being entirely baffled by it. His business associates also see a difference in his attitude and swings in his mood at work. When Karan's mother comes to know about these dreams, she advises him to go back to his roots- India, to get the answers he is seeking. Amidst all these, there is someone who is plotting against Karan and hatching plans to assassinate him. Karan however, miraculously survives the attempt and heads to India where his destiny awaits him. Running parallel to Karan's life is Karna's story. He is the one he dreams about. We all know about Suryaputra Karna, the unsung hero of Mahabharata. He was Kunti's first born and was eventually treated as the 'Sixth' Pandava at the end of his eventful life. Hence, the author has aptly named the first book of his Karna Trilogy as 'The Sixth'. Karna was known to be benevolent king; he defied social customs and traditions to achieve immortal glory by his virtues and skills. He became the king of Anga and the most trusted man of Duryodhana, the crown prince of Hastinapur. We all know how his association with Duryodhana ultimately sealed his fate. All of you who have grown up watching the legendary serial Mahabharata on Doodarshan will probably agree that when you think of Karna from Mahabharata, the face of actor Pankaj Dheer will come floating in your mind. Since, then many other versions of the epic have been aired on various channels, but I never had the chance of watching any of those (and I am glad about it). So, the face of Karna in my mind stays the one I saw in my childhood days. But, after reading this novel, a new face of Karna has surfaced in my mind. Thanks to the liberal use of sketches and graphics throughout the novel. Even though I am not very good at spotting typos, a couple of them did come to my attention. That is something that can be done away with by the editing team. The premise of the book sounds promising. While most of us already know about Karna, it is interesting how the author tries to amalgamate Karna's story into Karan's life. However, as a reader I did feel the flow of the story could be better. There were parts that could be elaborated, for example - the part where Karan braves a terrorist attack while on a business trip and saves his business partner. His journey in India also seemed to be rushed upon. Also, I really couldn't gauge the character of 'KPS' as he made fleeting entries here and there in the story in the style of a Bollywood villain. May be the author has intended it that way. But, somehow it didn't work for me. Since the story will span three volumes; there are too many unanswered questions when the first part of the trilogy ends. That does rouse the curiosity of the readers and all that can be done is, wait for the next book of the series to be released. I am looking forward to the next book of the series as I am curious to know what happens next in Karan's life. I received this book for Leadstart publishers in exchange for an honest review.